Paris offers no shortage of things to do. But sometimes you just want to get out of the city for a day. Commune with Nature. France’s rail system makes that easy. And relatively cheap. So let’s consider a day trip. To Giverny. To commune with Nature as Claude Monet perceived it. 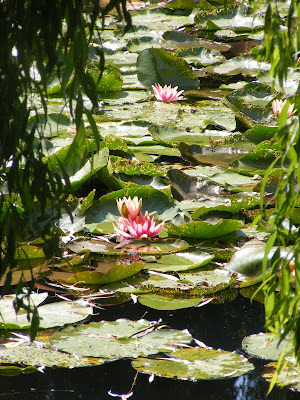 Giverny is a small town in Normandy, near the Seine River downstream from Paris. Monet chose it because it was out of the way. So no train station here. But the much bigger town of Vernon is just 6.2 kilometers (4 miles) down the road. And it does have a train station. Trains run from Gare St. Lazare in Paris directly to Vernon every two hours daily, and sometimes more frequently. The trip takes 45 minutes. For instance, there’s a train at 8:19 in the morning that gets you into Vernon at 9:05 and another at 10:19 that gets you there at 11:05. As Monet’s house opens at 9:30, that first train leaves you time to take the shuttle bus (parked just outside the train station) to Giverny - a 20-minute ride - and still get there in time for opening. A word to the wise: there will be a crowd. And a line. But you can book tickets early on-line and print them out, in which case there’s a side entrance (also marked “for groups”) where there will be no line. Lucky you. As the house is small, I suggest starting there. Before the tourist buses arrive if possible - which is where the 8:19 train out of Paris comes in handy. Monet’s actual studio is always the highlight for me, because I can imagine him painting there on rainy days. The last time I went, there was a huge photo of him in one corner, and there are always reproductions of many of his works (hanging to dry?) on the walls.. Then there’s his collection of Japanese prints, which he said inspired him. (The Japanese come as much to see them as they do the gardens, I think.) And after all the restful blues in the other rooms of the house, the sunny yellow dining room seems even brighter. Last of all, the burnished copper pots and pans hanging on the wall of the kitchen, and the blue-and-white tiles. Next come the gardens. I’ve been to Giverny multiple times, in different seasons (April through October) and I’ve never seen the same garden twice. Monet planned it all out very well, season by season, and a large cast of gardeners have maintained and improved on it ever since his death. At this time of year (June), it’s lush with delphiniums, rhododendron, poppies of many colors... all of it accented by allium standing tall. Not to mention all the rosebushes. Then it’s through the underpass - paid for decades ago by the Annenberg family - and just like going through the looking glass, you’re in another world, a much less planified garden... at least on the surface. Monet called it his “jardin d’eau”, his water garden. There’s a bamboo forest that grows thicker every year. And much other greenery. All framing the lily pond that Monet created from a brook called the Ru. (His neighbors were afraid that his strange plants would poison the water, so he needed the backing of City Hall to dig out the pond. But by 1893, who would refuse anything to the great Monsieur Monet?) You’ll see Monet’s rowboat floating near the Japanese bridge and, if you’re lucky, if it’s late enough in the season, and in the day, and if the sun is out, you just might see the water lilies open. It took me years for conditions to be ideal. That’s when I took this photo. After sitting a bit and taking it all in, retrace your steps. At the far end of the flower garden, past the turkeys and chickens, the exit is obviously via a gift shop, and this one is a pip (as the British used to say). If you don’t find something for Aunt Martha back home there, then you’re hopeless. As long as we’re visiting vestiges of Monet, you can stop by the cemetery alongside the village’s small church at the far west end of the same street as the museum (Rue Claude Monet, what else?) to see his grave. Nearby is a monument to the seven unfortunate British airmen who crashed here two days after D-Day in 1944. As for the Romanesque church, built between the 11th and 16th centuries, it’s topped by a typically Norman steeple and inside are some old pieces of art dating back to the 14th century. In between Monet’s house and the village church is another Impressionism museum. As one of the founders and leaders of the Impressionist movement, Claude Monet attracted other artists, some of them from as far away as the United States. (Far away because back then it took over a week to travel by boat to France from North America, not to mention crossing the nation to reach the docks of New York City.) John Leslie Breck, Theodore Butler, Lilla Cabot Perry, Robert Vonnoh, Theodore Wendel, Willard Metcalf, Louis Ritter, Theodore Robinson, Frederick Frieseke, Guy Rose, Dawson Dawson-Watson, Louis Paul Dessar, Thomas Buford Meteyard, William Howard Hart, Frederick MacMonnies, Karl Anderson, Richard Emil Miller... they all found their way to this sleepy village. In 1992, philanthropist businessman Daniel Terra opened the doors of his creation: the Museum of American Art in Giverny. Its purpose: “to explore the historic and aesthetic connections between French and American artists.” The modern building he commissioned is unobtrusive from the outside, all light and huge hanging walls inside. It's perfect. But Mr. Terra died in 1996 and the museum, as such, outlived him by only ten years. Although there is still a Terra Foundation, the museum was handed over to the regional authorities and has become the Musée des Impressionismes. It now operates in conjunction with the Musée d’Orsay and the Musée Marmottan Monet in Paris, as well as with the Fondation Claude Monet. After recent exhibits on artists such as Caillbotte and the Paris years of Sorolla, the present exhibit focuses on musical instruments as represented in Impressionist art. But back to those American artists who wandered all the way to Giverny only to find there were no hotel accommodations. The first one, Willard Metcalf, knocked on the village grocer’s door as the sun was starting to set. Madame Baudy opened the door, stared at the bearded giant spouting some gibberish in abominable French about a bed - she only had her own - then slammed and locked the door. Months later he came back, with artist friends, and she realized what they wanted... and that there was money to be made. She gave up her bed and slept at the neighbor’s, coming back the next day to cook for them. The rest is history. Monsieur Baudy stopped selling his sewing machines on the road and built a bigger house, which he turned into a hotel. And a restaurant. Today you can’t sleep at the Auberge, but you can eat there. Inside or on the terrace under the trees. The setting is bucolic, the service snappy and friendly, the food fresh, good, copious and not too expensive, especially for people used to Paris prices (either à la carte, or 30€ for a three-course meal).. Eaten at a leisurely pace, hopefully in good company, that just leaves time to walk back downhill to the shuttle. As the buses are well-coordinated with French Rail, there’s one that leaves at 16:10 and gets you to the train station by 16:30. Plenty of time to even have a glass of something refreshing at the café across the street and still make the 16:53 train back, arriving in Paris at 17:40... just in time for rush hour. Welcome back to the modern world!